Beat Nite 12 takes place Friday, March 6th during Armory Arts Week. Poster design by Edith Letcher, courtesy of Norte Maar. Save this date! On Friday, March 6th the Bushwick art world will be turning to a faster tune as Beat Nite causes a scene during the forthcoming Armory Arts Week. Produced by Jason Andrew and organized by non-profit arts organization Norte Maar, Beat Nite is everyone's favorite late night gallery hop where neighborhood art spaces keep their doors open late for enthusiastic visitors and collectors. Beat Night’s 12th edition is curated by Ben Sutton who is a Brooklyn-based art writer, critic, Metro Editor at Hyperallergic and a great Bushwick aficionado. "Part of what I love so much about Beat Nite is that it always encourages me to go discover galleries I know about but have never actually visited," Ben told us. Ben is most looking forward to the Jonny Gillette's "Goals on Balls" at Kimberly-Klark and “Loominosity” which is opening this Friday night at OUTLET with a rare showcase of new textile works. 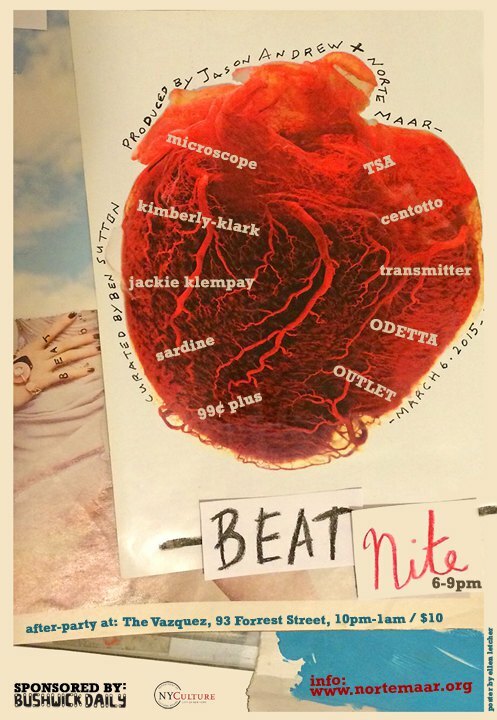 Described by ARTINFO as “…the most underground, exciting, and fiercely independent pockets of the New York art world,”this edition of Beat Nite will highlight relatively new spaces like Kimberly-Klark in Ridgewood, Transmitter on Willoughby Ave. and ODETTA, which had one of our favorite shows of 2014. Other galleries along the Beat Nite path include Microscope Gallery, TSA New York, Sardine, 99¢ Plus Gallery, Jackie Klempay and Centotto. This year Bushwick Daily is excited to be a media sponsor, and during the week of March 6th we’ll be sharing our top picks for opening receptions taking place the night of the event. The 2015 Armory Show will be going on the same weekend – March 5-8 – celebrating seventeen years of bringing together artists, galleries, collectors and curators from all over the world with cultural events across all five boroughs and widespread coverage of New York City's artistic communities. Beat Nite 12 takes place on Friday, March 6th from 6-10 pm, followed by an after-party at The Vazquez, 93 Forrest Street., 10pm – 1am. Tickets are $10 at the door and include a drink ticket. Download the event map here.